If you’re a busy woman who’s always on the go, you might have little to no time for makeup and hairdo. Whether you’re a stay-at-home mom or a corporate CEO, it is possible to still look good and feel great even with a very busy schedule. Looking your best should not take that long. From simple hacks to time-saving beauty products, you can step of the door looking like you’ve just gone out from a beauty salon. 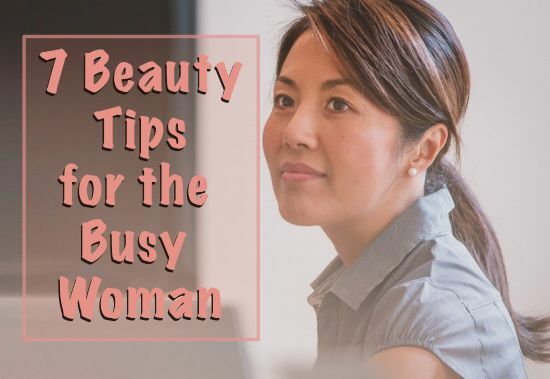 Here’s a roundup of the 7 beauty tips for the busy women. If you know of other useful tips, make sure share them in the comments below. Washing your hair every single day will most definitely eat up a lot your time. This is why every busy woman should include dry shampoo as part of their beauty essentials. Just a quick spray can cleanse greasy hair in less than a minute without any water, saving you more time and energy. Beauty experts suggest that hair should be washed less frequently–ideally, every other day–so your hair won’t strip essential oil that naturally moisturizes and protects the hair. Instead of using foundation and bronzer, go for a tinted moisturizer with SPF. This way you can do all four steps into one. Apply and blend it in using your fingertips just like with your normal moisturizer. Still using different makeup separately? Why not use a cream blush, an all-in-one product that truly multitasks for the cheeks, lips, and eyes. Choose a sun-kissed color to give your face a warm, natural glaze. Don’t you know that sleeping with makeup on will increase your chances premature aging and clogged pores? That’s right. It will unleash free radicals that break down the skin’s natural collagen, which can lead to wrinkles and fine lines. So for those days when you’re just too lazy to wash your face, beauty wipes is a must to remove dirt and makeup quickly. The trick here is to choose one that has organic ingredients so it’s not harsh on the skin. 4. Get a nice haircut. Every woman needs a great haircut that complements her face. Talk to your hairstylist about giving you a simple haircut that’s manageable and chic if you don’t have the time to style. Go for a haircut that is long enough to style with a ponytail, something that is between chin and shoulders. If you constantly find your beauty products cluttered everywhere in your bedroom or bathroom, then this is where you’re probably wasting precious time on. It’s easier to get ready when your space is organized and you know exactly where to look for your stuff. A clear cosmetic organizer such as this one from Amazon will keep all beauty essentials in one place so you can get those makeup on and hair done in no time. Don’t you know that while we’re asleep, our body produces hormones that are responsible for cell repair and renewal? If you want to have a healthier and younger-looking skin, you should get at least 7-9 hours of sleep. Many of the overnight moisturizer creams and hair treatments work well at night when they are absorbed more quickly, making your skin noticeably radiant in the morning. No time for a trip to the nail salon? No problem. Try to buff your nails, instead. Using a four-sided buffer tool, it will show you which side you should rub your nails on and apply a hand cream right after to keep your hands look clean and put together. Disclaimer: When you click and buy products from this blog, I may earn a small commission for my endorsement, recommendation, testimonial, and/or links to any products or services. Your purchase helps support my work in bringing you valuable content about the spa, health, and wellness.